Drive around any Arizona neighborhood and you are likely to see predominantly two roofing types: Shingle and tile. There’s a good reason for that! Both shingle and tile roofing are relatively affordable and long-lasting, and they both stand up to the harsh conditions of the Arizona climate. Arizona has harsh monsoon storms every year, and the Phoenix Valley Area gets hammered with punishing rains. Those storms can take a toll on your roof. Phoenix Shingle roofing tends to suffer more damage from the excessive water exposure. Shingles can rot if exposed to standing water. The granules can break down and weaken the shingle, making leaks more likely. Tile is mostly impervious to water damage. The monsoons also bring high winds. Those winds can rip a shingle or a tile right off the roof and carry it away hundreds of yards. Both shingle and tile roofing can take a beating by high winds. However, shingle has a slight advantage here since it has a lower profile. There is not as much material sticking up for the wind to grab. Any shingles that have been blown off will need to be properly repaired. Tile that has been blown off will likely crack or break, and it cannot simply be put back in place. Arizona enjoys a sunny climate throughout much of the year. But in the summer, the sun’s rays can become positively unbearable. Temperatures are routinely in the triple digits. Shingle roofing can crumble under the heat – literally. The heat and the UV rays can break down the material much more quickly than in tile roofing. When it comes to the projected lifespan of the roof, tile does have a slight advantage. So long as the roof is well-maintained and nothing catastrophic happens, Phoenix tile roofing can last anywhere from 30 to 60 years, depending on the material used in the tile. In contrast, shingle roofing that is well-maintained can last about 15 to 50 years. Of course, you’ll pay a premium for the long-lasting material. Tile roofing costs much more than shingle, which is why many people end up choosing shingle. But if you break down the cost by year, tile roofing ends up being the better buy in many cases. Not every property can support a Phoenix tile roof. The heavier material requires much more support, and it can only be used on roofs with a certain pitch. You may be able to reinforce your roof if you want tile, but you will have to pay the additional costs to bring to code to meet requirements for concrete tile roofing. Shingle roofing, on the other hand, can be used on just about any property. The weight is certainly no issue, and it can be used on a variety of pitches. Ultimately, the best way to know whether shingle or tile would be best for your roof is to talk to an experienced Phoenix roofing contractor about the particular needs of your property. Your roofer will help you understand the costs, the life span of the material, how it needs to be maintained, and more. Allstate Roofing is the roofing company that Arizona residents trust. Our experienced and licensed roofing contractors perform roof repair and re-roofing for shingle and tile roofing, as well as other types of popular roofing, such as foam roofing for flat roofs. Our contractors will help you select the right roofing type for your budget and your needs, and they will develop a maintenance plan that will keep it in top shape for years to come. 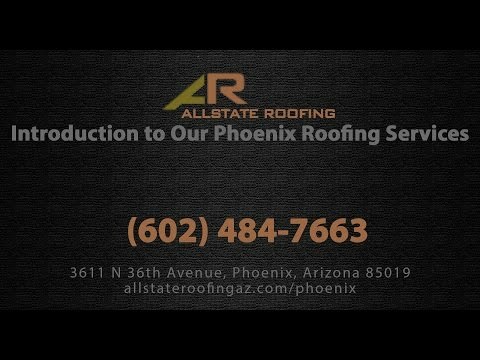 Call Allstate Roofing of Arizona today to talk to a roofer and to schedule a free estimate for your residential or commercial roof repair or re-roofing.